Tomorrow, October 14th, 2012, will be the hundredth anniversary of the day Theodore Roosevelt was shot in the chest and then proceeded to deliver a 90 minute speech to an aghast crowd as blood seeped through his shirt and his breath shortened. Only when he was finished delivering his prepared remarks did he allow his aides to rush him to the hospital. 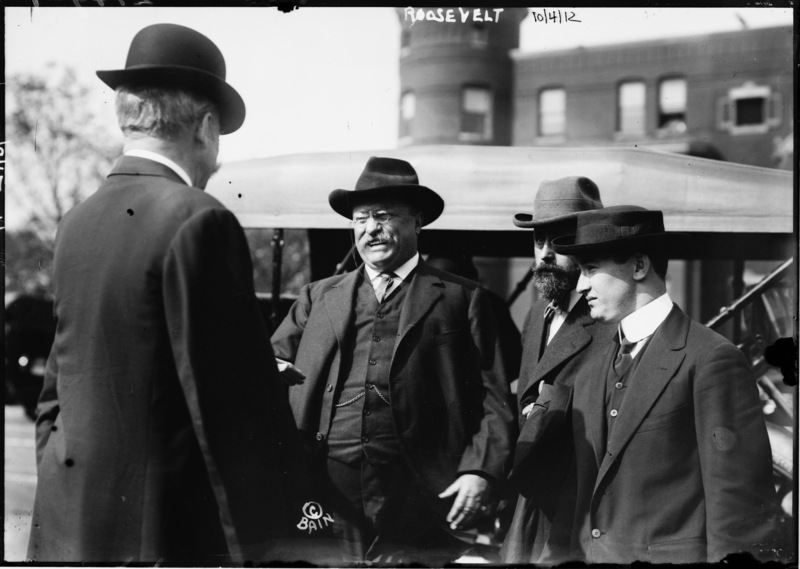 TR was on the campaign trail in Milwaukee, running for president as a candidate for the Progressive Party. He had already served two terms as President, the first from 1901 to 1905 when he finished William McKinley’s term due to McKinley’s assassination six months after he took office. The second, 1905 to 1909, was his only elected term. He deliberately chose not to run for a third consecutive term in the 1908 election, supporting William Howard Taft over his own Vice President Charles Fairbanks. Taft won the election, but TR would soon fall out with the successor he had picked. Although Taft prosecuted more trusts than Roosevelt had, as a lawyer and judge he believed any such actions to be the role of the judiciary. 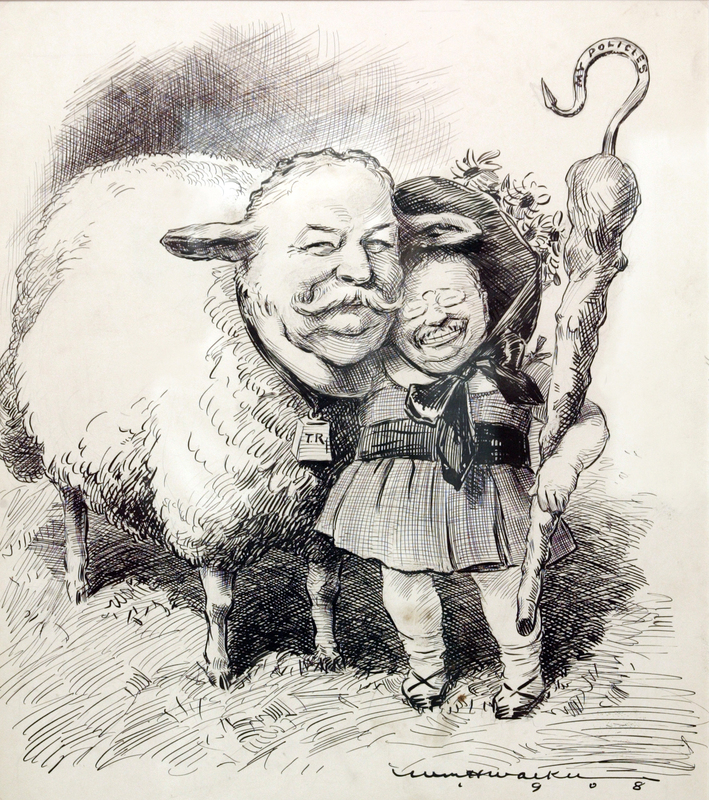 Roosevelt was disappointed with what he saw as Taft’s do-nothing administration, and Taft’s conservative rhetoric had little in common with Teddy’s heated defense of the consumer and government by, for and of the people. On a somewhat two-faced note, he also resented the Taft government’s 1911 attempt to break up U.S. Steel, whose purchase of its main competitor Roosevelt had personally approved in 1907. Theodore Roosevelt thus decided to run again for President in 1912. Things got raw on that campaign trail. Roosevelt called Taft a shill for the bosses and politically corrupt; Taft called him the greatest menace to American instutions. Roosevelt called Taft a “puzzlewit” and Taft called him a “prize honeyfugler,” which I think we can all agree is objectively awesome. Roosevelt won nine out of twelve Republican primaries that spring, but most of the states didn’t hold primaries. Their delegates were assigned at state conventions and caucuses via deals in smoke-filled rooms. 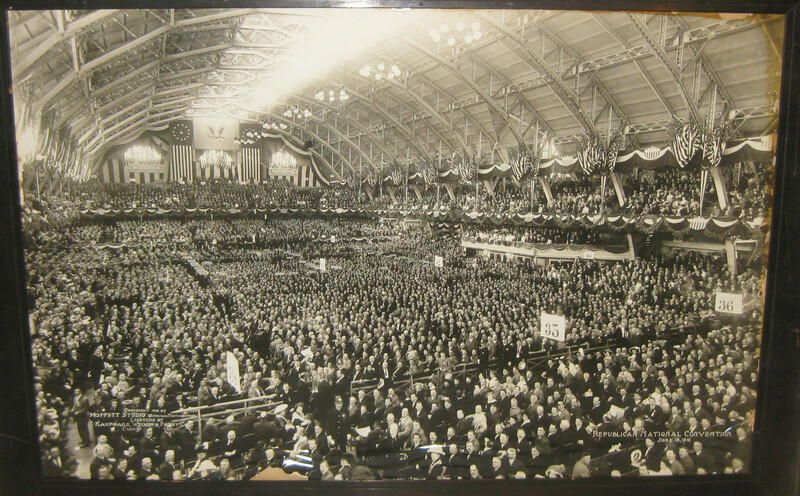 At the Republican National Convention in Chicago in June, the Republican National Committee, controlled by the conservative wing of the party which supported Taft, assigned all disputed delegates to their man. It was mayhem on the convention floor. After all Roosevelt’s attempts to secure more delegates failed, he walked out of the Chicago Coliseum and told his pledged delegates not to vote. In August, he founded the Progressive Party, also known as the Bull Moose Party, and ran for President against Taft, Democratic Party candidate Woodrow Wilson and Socialist Party candidate Eugene V. Debs. With a four-way race and all these political tectonic plates clashing against each other, the presidential campaign of 1912 was a tense one, to say the least. Enter John Flammang Schrank, a Bavarian immigrant who had moved to the United States when he was 9 years old. His parents died soon thereafter, and he was raised by his aunt and uncle who ran a saloon in New York City’s Lower East Side. In 1904 when Schrank was 28, his 19-year-old girlfriend Emily Ziegler was on her way to a church picnic on Long Island when the steamboat she was on, the General Slocum, caught fire. John was supposed to accompany her that day, but he couldn’t find anyone to cover his shift at the tavern. Emily and 1,020 other people died by fire or drowned in the East River. There were only 321 survivors. Schrank was reported in the local newspapers as having shown up at the morgue “wild-eyed” where he identified her burned body. The General Slocum disaster was New York’s worst tragedy in terms of lives lost until September 11, 2001. 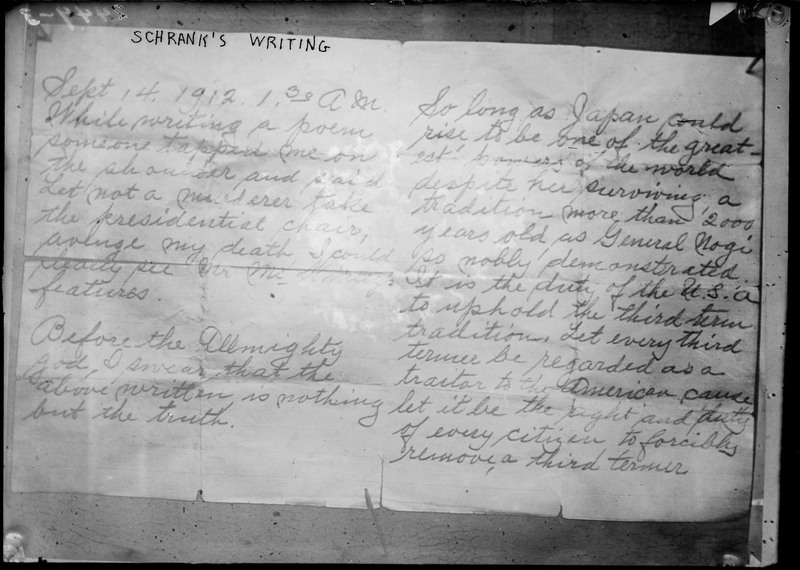 Schrank’s uncle and aunt died in 1910 and 1911, leaving him their property. He was devastated, seeing them more as adoptive parents than as relatives. He sold his inheritance and holed up in sleazy motels, drinking, writing poetry, reading the Bible and several newspapers daily. Although he had admired Roosevelt, even going so far as to have his picture on the wall along with those of Lincoln, Grant and Garfield (the first and third of whom were assassinated, just for the record), when TR sought a third term and even went so far as to create a new party to secure his nomination, Schrank saw Roosevelt’s ambition as a slap in the face to the Founding Fathers (Washington had refused a third term and all presidents after him had also served no more than two terms, although Grant tried and failed to get a nomination for his third). To Schrank, Roosevelt’s campaign spelled certain disaster for the country: if he won, they’d have a Caesar in power; if he lost, he’d call foul like he had at the Republican Convention and plunge the country into another Civil War. While writing a poem someone tapped me on the shoulder and said Let not a murderer take the presidential chair, avenge my death. I could clearly see Mr. McKinley’s features. Before the Allmighty God, I swear that the above written is nothing but the truth. So long as Japan could rise to be one of the greatest powers of the world despite her surviving a tradition more than 2000 years old, as General Nogi so nobly demonstrated. It is the death of the U.S.A. to uphold the third term tradition. Let every third termer be regarded as a traitor to the American cause. Let it be the right and duty of every citizen to forcibly remove a third termer. That note is dated September 14, 1912, the same date on which President McKinley had died 13 years earlier after being shot by anarchist Leon Czolgosz (assuming it wasn’t TR in disguise as a monk all along, of course). General Nogi was a hero of the Russo-Japanese War who offered to kill himself when he felt he had lost too many in the process of capturing Port Arthur (1904-1905). Emperor Meiji declined, but on the day of the emperor’s funeral, September 13th, 1912, Nogi committed ritual suicide so as not to outlive his master. He seems to be saying that Japan became a world power despite its 2000-year tradition of feudal submission even unto death, but that an equal dedication to American tradition even unto death is what will keep the Republic alive in the face of third-termer would-be kings. By September 14th, Schrank had been following Roosevelt around the country on campaign stops for four days. He kept at it for another month, waiting for the perfect opening to take a shot. That opening happened in Milwaukee on October 14th. 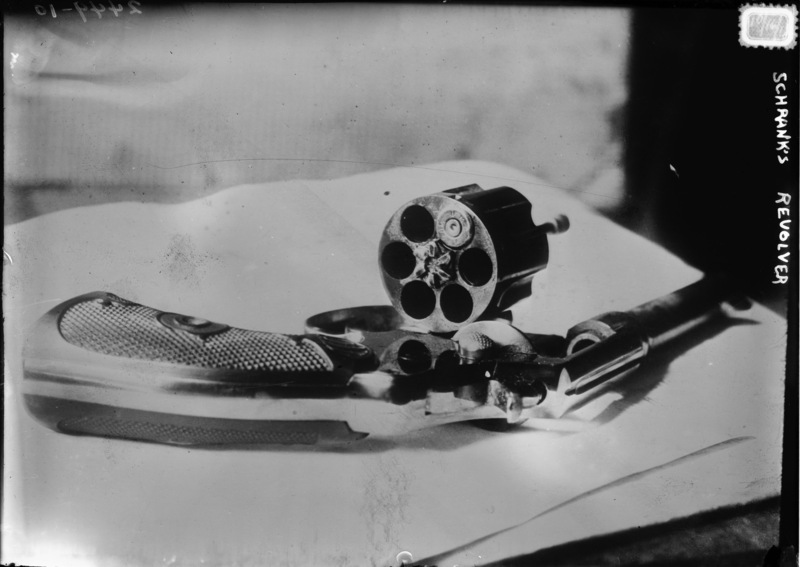 Roosevelt, on the way to give a speech at the Milwaukee Auditorium, took a moment to wave to the crowd from his car when Schrank raised his Smith & Wesson .38 caliber revolver and fired a single shot. Roosevelt bounced back up, at first unaware that he had been hit. His secretary Albert Martin jumped on the shooter, and he and the police kept him safe from the furious crowd demanding Schrank be lynched on the spot. Roosevelt asked that Schrank be brought before him so he could ask why he had shot him. Schrank did not reply, although he would tell the police everything after his arrest. With an expression of pity for the poor deranged man, Roosevelt and his team got back in the car and headed to the auditorium. On the way, one of his companions noticed there was a hole in TR’s overcoat. Teddy touched it and saw that he was bleeding, that he had in fact been shot. His escorts of course wanted to change direction and drive straight to the hospital; however, Teddy Roosevelt coughed a couple of times and when he saw no blood, figured the bullet hadn’t made it to his lungs, so he insisted on being driven to his speaking engagement as planned. Friends, I shall ask you to be as quiet as possible. 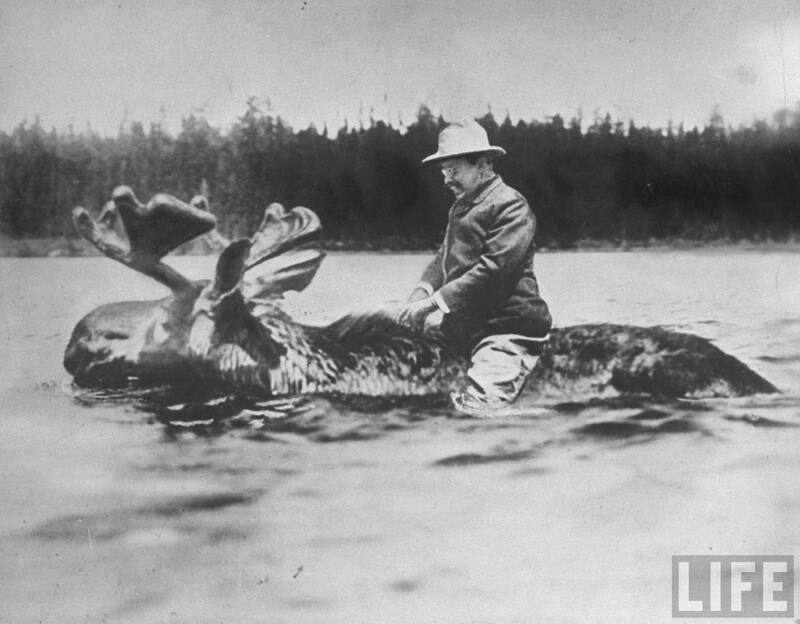 I don’t know whether you fully understand that I have just been shot; but it takes more than that to kill a Bull Moose. But fortunately I had my manuscript, so you see I was going to make a long speech, and there is a bullet — there is where the bullet went through — and it probably saved me from it going into my heart. The bullet is in me now, so that I cannot make a very long speech, but I will try my best. He opened his overcoat to show the crowd the bloody bullet hole. 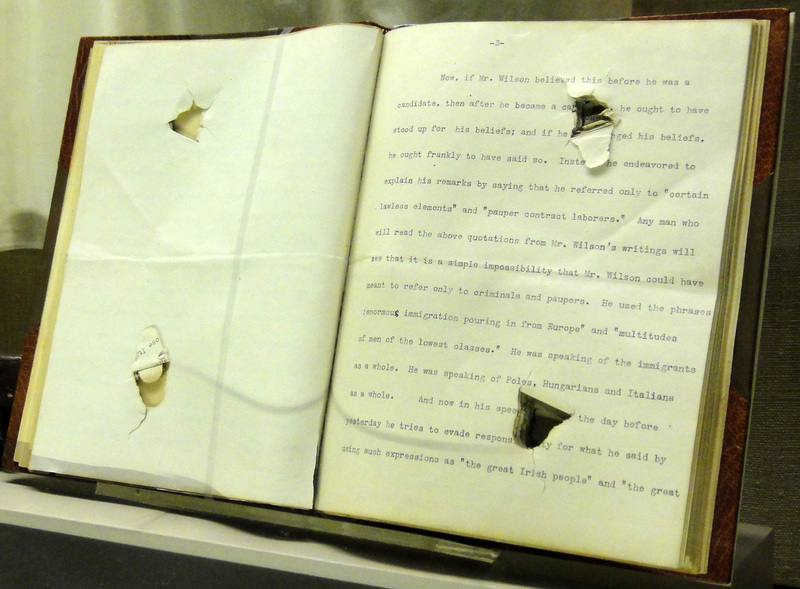 His 50-page speech had two bullet holes in it (it was folded in half in his pocket) and his eyeglasses case had a hole in it too. These obstacles had slowed down the bullet enough to keep it in the fleshy part of his chest, although it was on an upward trajectory towards his heart. An hour and a half later, his speech finally done, he was taken to Johnston Emergency Hospital where six surgeons operated but could not find the bullet. 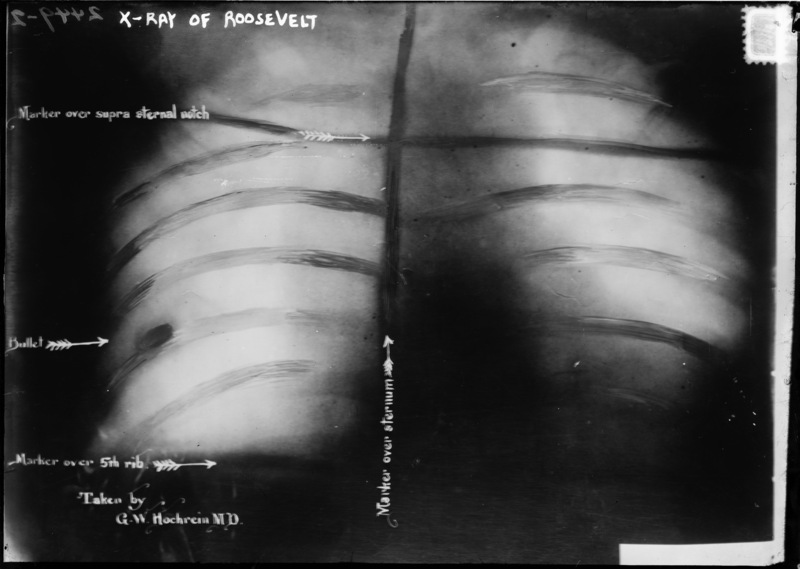 X-rays showed that the bullet was 3.5 inches under the surface of the right side of his chest, touching his fourth rib. Only a thin layer of tissue separated the bullet from the pleural cavity. He recovered for a week at a Chicago hospital. Seeing that he was improving, doctors decided it was better to leave the bullet where it was than to attempt to remove it surgically with all the attendant risks. Roosevelt got much sympathy from the people and from the other candidates, who suspended their stump speeches because Roosevelt was unable to deliver his. He was not, however, carried to the presidency on a wave of pity. He beat Taft in popular and electoral votes, but both of them were defeated handily by Woodrow Wilson. 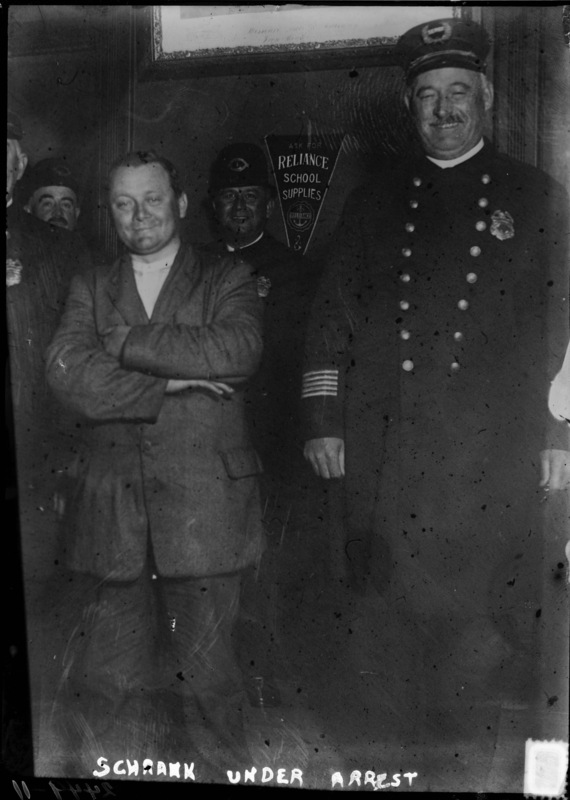 President Taft, in one of his last presidential acts, pardoned Captain Van Schaick, the captain of the General Slocum who had been convicted of criminal negligence in the disaster and sentenced to ten years in Sing Sing. Schrank pled guilty to attempted murder, was found to be insane and was confined for the rest of his life to Central State Mental Hopsital in Waupun, Wisconsin. He died of bronchial pneumonia in 1943 at the age of 67. Theodore Roosevelt died in his sleep of coronary thrombosis in 1919. He was 61 years old. Theodore Roosevelt’s birthplace at 28 East 20th Street in New York City is now a National Park. They had an exhibit on the 1912 campaign earlier this summer which has now moved to the Oyster Bay Historical Society where it will be on view until November 11th. To get a virtual dose of TR, see the Library of Congress’ collection of Teddy Roosevelt captured on film and audio recordings of some of his speeches.